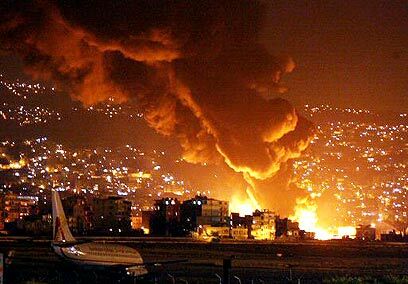 Night attack in Beirut: Israeli planes struck a bridge in the southern suburb of Beirut, a Hizbullah stronghold, and the fuel stores of the Jiyyeh power plant south of the city early Friday, witnesses and security sources said. The Air Force also took part in the offensive and struck two petrol stations in one of the country's main routes as part of the ground closure. The Navy continued to impose the naval closure. Three people were killed and 55 wounded in the pre-dawn raids on the Shiite Muslim suburb, the Beirut police said. Shops and buildings were damaged and dozens of cars wrecked in the district, home to hundreds of thousands of people. Eyewitnesses and security sources reported that Israeli aircrafts fired at least seven missiles at the neighborhood. The Lebanese Army responded with anti-aircraft fire. Residents heard at least three strikes. Lebanese security sources also reported that Israeli planes struck the main highway leading to Beirut's international airport and south Lebanon. Other news reports said a playground where Hizbullah leaders hold rallies for thousands of their supporters was also targeted. 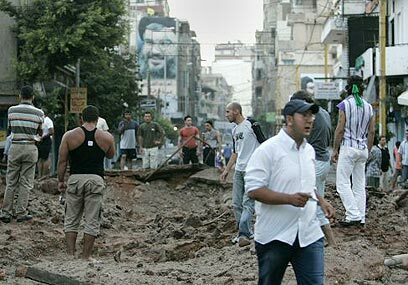 Israel Defense Forces officials confirmed that the army had struck targets in Beirut. On Friday morning, the Lebanon police reported that IAF aircrafts attacked a base of Ahmed Jibril's organization, the Popular Front for the Liberation of Palestine – General Command, at the Bekaa Valley, only 2 kilometers (1.24 miles) away from the Syrian border. Earlier, Israeli planes struck the main highway linking Beirut to the Syrian capital Damascus, a Lebanese security source said. The jets struck at least five separate times along different points of the international route, the source said. Witnesses said the road was clear of traffic after earlier congestion as tourists fled Lebanon to neighboring Syria. IDF officials said Friday morning that "targets at the Hizbullah organization's main headquarter in Beirut were struck from the air. The IDF attacked the security building and the guard at the organization's main headquarters. In addition, the IDF attacked the bridges and access routes to the area." According to the army, "the center attacked releases orders and instructions and conducts terror activities." Israeli officials said on Thursday that Israeli forces planned to strike the key highway as part of an assault aimed at retrieving two soldiers seized by Lebanese Hizbullah guerrillas. Israel had already bombed Lebanon’s airports and blockaded the country from the sea, bringing trade and tourism to a halt. The IDF said that the Beirut airport constitutes a transportation and shipping station of arms for Hizbullah. The Air Force struck runways and the airport was closed down. Earlier, missile boats hit a group that fired a Katyusha rocket. IDF officials said that the army was operating according to plan, so that Lebanese targets are attacked every once in while and that the operation will eventually harm Hizbullah's capabilities. The IDF already reported that it struck close to 100 Hizbullah targets, including arms caches and launching sites. Army officials claimed that the fact Hizbullah continued to launch Katyusha rockets toward Israel, and even extended the range to Haifa, does not mean that they would be able to continue doing so for a long time. According to senior officers, senior Hizbullah officials are in distress and fear Israel's response. Military officials estimated that the weekend at the northern border may be accompanied by Katyusha fire. "The residents here understand it and know that eventually patience will pay off. It's not logical to judge the consequences according to the events in the last 24 hours," a Northern Command officer said. Lebanese officials said Israeli aircraft dispersed thousands of leaflets above the Shiite-dominated areas of southern Beirut Thursday evening, warning citizens to stay clear of Hizbullah offices and operatives. "For your own safety and because of our desire not to harm any civilians who are not involved (with Hizbullah), you should refrain from staying in areas where Hizbullah is present and operating," said the Arabic-language leaflets, signed "The State of Israel". Eyewitnesses said hundreds of residents were seen leaving the capital. IDF sources said several senior Hizbullah members have gone into hiding. “We assume Hizbullah will continue to launch attacks, also on Haifa, but at the end of the day the organization will be defeated,” one official said. Beirut’s Dahiya neighborhood, a Hizbullah stronghold, has been marked as the IDF’s key target for the next 24 hours. The organization maintains several weapons cashes and its headquarters in the neighborhood. “We have no intention of seeking revenge, but to simply strike what is dearest and most important to Hizbullah,” a military source said. 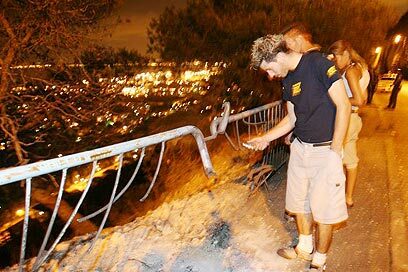 The security establishment decided to intensify the attacks in Lebanon after a 122 millimeter missile was fired at Haifa. The IDF rejected Hizbullah’s claims that it was not behind the missile attack, saying it had proof the organization did in fact launch the missile toward Haifa. A similar Katyusha was fired just hours earlier at Carmiel. Lebanon has asked for an immediate ceasefire, but a senior Northern Command officer said “we do not intend to respond positively until the operation’s objectives have been attained. The resident of the north understand this and are willing to accept the disruption of their daily lives, including the cancellation of summer camps. “We must remain patient; the operation began only 24 hours ago,” he said. IDF sources said that after Hizbullah stated that “If Beirut or its suburbs will sustain Israeli attacks, we will attack Haifa,” it will not show restraint in its actions against the organization. “We hold Lebanon, which allows Hizbullah to operate from its capital, responsible for the attacks on the north,” an IDF official said. See all talkbacks "IDF bombs Hizbullah stronghold in Beirut "